When Hillary Schneider, ILARI'S creator, first moved to New York City from the Midwest she aspired to find what every post-graduate, twenty-something seeks; to have fun, make new friends, forge an identity and just maybe... find love. It quickly became clear she needed an edge in this ultra-competitive world of New York City dating. She embarked on a quest to create her own, personal Love Potion Number Nine." Donning a complex mixture of scented oil and body mist, Hillary was stopped in shops, restaurants, and even on the street with inquiries about her complicated and not easily attainable fragrance blend. Approached outside a downtown restaurant one evening, an attractive, fellow diner remarked, with what she likes to believe was complete sincerity, "I could fall in love with a woman who smells as beautiful as you..."
Hillary and the attractive stranger were married in July, 2009 in a very New York City wedding. Isn't that a beautiful love story? What a great way to start a perfume line! Ilari Perfume ($65) is a roll on, which I love because it's easy to store in your purse and there is no leakage like regular perfume bottles. This is a blend of jasmine and sandlewood mixed with with a tang of orange blossom. I would call this a "romantic" flowery scent that should be applied sparingly. I've never been a fan of "floral" scents, and jasmine is my least favorite flowered scent. I wore this out the other day, and I got tons of compliments! Just a little behind my ear and on my neck lasted throughout the day and left me with a fresh light smell that many people were asking about. I realized at first whiff of the perfume it appears stronger, but it smells much lighter on the skin. 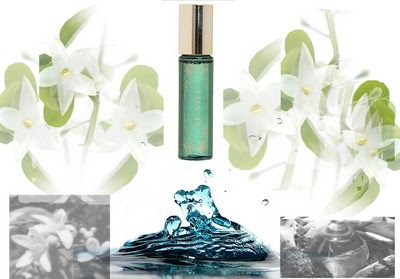 Final Thought: The Emerald bottle is beautiful, and the scent worn correctly is quite feminine and romantic. Like every perfume, this might not be for everyone, but I think it's a great smell for springtime! You can purchase Ilari at Ilarinyc.com or Barneys for $65. The Giveaway: One winner will win a full sized roll on Ilari Perfume. ($65) To enter, just tell me why you want this and what special occasion you would use it for!! For 2 Extra Entries each, Follow me on Google Friends, Like Us on Facebook, Follow me on Networked Blogs, Follow me on Blog Luvin, for for one additional entry each day, Tweet or Share this giveaway on Facebook!!! Good luck all! Giveaway will end 1/12/2010. Open to the US only. Winner will be chosen by random.org and will have 48 hours to respond to the winning email. I love the idea of a roll-on perfume that can be kept in my purse. The scent sounds great - I love jasmine. I'd use this for an upcoming wedding I'm attending. I would love to win this because it's small and I can carry it everywhere in my purse! I would love to win this! I would use it for a nite out on the town. I'd give this to my DIL and she would wear it when she and my son go to Las Vegas for his birthday. I would love a new scent for new years. I haven't celebrated a good new years in a long time! a great start to a new year! I would love this for daily use to perk me up from the winter blahs. No special occasion really.Seems like it would be wearable anytime. I would love this because it is easy to carry in my purse and I would wear it everyday because you don't need a special occasion to smell great! I like it because its different, and easy to apply. I want it because it sounds great. I would wear it for New Year's Eve. I want this because I like a light smelling perfume. I would wear it "Every Day", because they are all special occasions to me. I love a nice scent, and I always love to win one! I would use it every day! i would love to win this for my mom, and she could use it on a night out with the girls! I want this because I love trying new perfumes and I'd like to wear this on my anniversary date. I'd love to win so I could give it to my Sis for a surprise vacation gift. I would love to win this because I could use it on my short traveling trips! jasmine is my favorite scent. currently fighting cancer and just out of treatment and isolation. I would wear for my first night out with my husband again or my birthday which is fast approaching. sounds lovely. I would love this because after 2 back to back pregnancies, I would love to have something to make me feel pretty again! I want this because I have been looking for a new perfume. I have an anniversary coming up that I would use this for. I would use this for our Valentine's weekend getaway this coming year. Id like this because I am sick of all my old scents. I would use it for our Valentines Day date night. I love finding new perfumes and would only wear this when I go for doctor appts or tests. I have been disabled since 2004 so it is a rare treat for me to get a new fragrance. I have to make them last as long as possible so I save them for when I have to go somewhere. I love a light pretty scent and this sounds like it would be a perfume I would enjoy. I would wear it anytime, just for me or my boyfriend. I can never have too many perfumes. Something different for each of my moods. I also want to find a man. Think I can get lucky with this perfume, too? I follow you on networked blogs as Dee G.
I would use it to smooth out my wrinkles for my auditions. I love trying new smells and I love that it is small enough to carry. I would use this for a date night with my husband. I like to discover new fragrances that maybe most people don't have. It makes me feel good when people stop to tell me that they love my perfume. I would wear this on date night with hubby! I'd like to win this so I could wear it when my husband and I celebrate our anniversary. I like the convenience of roller perfumes and recently had one like this. I'd love to try this because I've been looking for a new fragrance that's beautiful yet different, for a long time. This sounds so good. I love both these scents, and I'm sure mixed, they are divine! I would wear it when I go home to see my family for the first time in a year. :) Thank you so much for the giveaway. I would love to win this because it contains sandalwood-my favorite. I would wear this all the time, not just for special occasions. I would love to win this! I would use it for when hubby and I have our date nites.